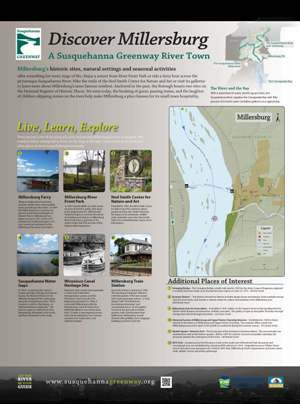 Millersburg's historic sites, natural settings and seasonal activities offer something for every stage of life. Enjoy a sunset from River Front Park or ride a ferry boat across the picturesque Susquehanna River. Hike the trails of the Ned Smith Center for Nature and Art or visit its galleries to learn more about Millersburg's most famous resident. Anchored in the past, the Borough boasts two sites on the National Register of Historic Places. These are believed to be the last wooden double-stern wheel paddle boats operating in the nation. In 2006 the Millersburg Ferry crossing was placed on the National Register of Historic Places. Millersburg Ferry began service in 1817 and in 2011 transported 20,000 passengers. It is now owned and operated by the Millersburg Ferryboat Association. In 1807, Daniel Miller set aside nearly 20 acres of land for public park space in his original plan for "Millersburgh". Today his legacy is used by thousands of residents and visitors as Millersburg River Front Park, a gateway to the Lykens Valley Rail Trail and site of the historic Millersburg Ferry. Founded in 1993, the Ned Smith Center for Nature and Art connects nature, people and the arts; while furthering the legacy of its namesake, wildlife artist, naturalist and writer Ned Smith. In 1968, recognizing the region's unique geological heritage and natural beauty, the National Parks Service officially designated five water gaps along the Susquehanna River- from Liverpool, south to Harrisburg- as "National Natural Landmarks." The first two gaps are visible from here: Mahantango Mountain to the north, and Berry Mountain to the south. America's early canals were essentially a water-based interstate transportation system and the Wiconisco Canal was part of it. Beginning operations in 1848, it connected Millersburg with the Pennsylvania Canal at Clarks Ferry. While the distance was barely more than 12 miles, it encompassed seven locks, three aqueducts, two culverts, one dam, five waste weirs, and eighteen bridges. Upon the station's opening in 1898, The Harrisburg Telegraph offered a vivid description of the new Queen Anne style passenger station- a "neat design" with "Hummelstown brownstone trimmings" and "ornamental stucco on the gables." Around it, the grounds included gardens with colorful plants that spelled out "Millersburg," ponds stocked with goldfish, and a baggage building perched on the hill.